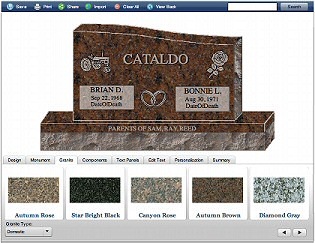 Your memorial selection is designed while you watch on our state of the art design system. If we don't have the design you want we can get it or custom design it for you. Our crafts people adhere to long established methods and practices to ensure that what you see and approve is what you will get. Only when you are satisfied with the stone selection and design do we commence the carving of the memorial. We craft quality memorials from stone gathered from near and far. We offer the traditional grey granite from Elberton, GA and Barre, VT. When it comes to color variety we offer outstanding stone such as: Salisbury Pink (from Salisbury NC), Dakota Mahogany, from (South Dakota) and Flash Black (from Africa) just to mention a few. To see examples of grain and color click here. Deciding on the right memorial and finalizing the design should be all there is to placing a memorial at your loved ones grave site. The reality is that each cemetery has differing rules regarding design, shape, color and content on memorials. Also, they can have differing rules on how a stone is set. It could be a hassle, but we take care of all of that for you. In most cases we have already contacted or will contact the cemetery to insure that your choice will be acceptable to their criteria before we ever start fabrication. Over time the elements and even vandals damage memorials. If you need an existing stone cleaned, repaired or reset we can help. 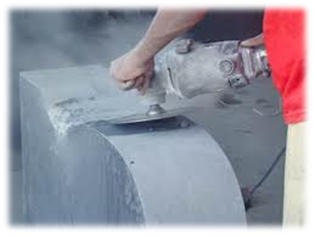 We have the equipment, resources and knowledge to help restore a stone to almost new condition. While we don't do kitchen remodeling or cabinetry, we do offer counter tops in a wide variety of granites and lovely colors.